I think we can all agree that a good night sleep is a wonderful thing. But, to be honest, there are some nights I have a very hard time falling asleep. Some nights my mind is just so full of so many disjointed thoughts that I just toss and turn for hours. I used to take an OTC allergy medicine to help me to fall asleep. It did help me but, I would wake up groggy and zombie like. Imagine how thrilled I was to find out about the new product, ZzzQuil. 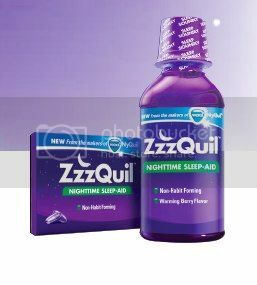 ZzzQuil is brought to you by the makers of Vicks NyQuil, and is for when your only symptom is occasional sleeplessness. It is not for colds, it is not for pain, it’s just for sleep. ZzzQuil sent me a sample and, in all honesty, I was skeptical. Boy was I pleasantly surprised that it worked so well! I fell right into a pleasant deep sleep and woke up feeling refreshed and ready to take on the day! ZzzQuil’s active ingredient, diphenhydramine HCI, helps reduce the time it takes for you to fall asleep when you are like me and have difficulty falling asleep. ZzzQuil is the only over-the-counter sleep-aid medication available in both Liquid (Warming Berry flavor, which I received and tastes really good BTW) and LiquiCap® forms. ZzzQuil is a sleep-aid product that delivers the effective relief that consumers have come to expect from Vicks products. ZzzQuil is intended for adults and children 12 years of age and older. I love that it is non-habit forming as well as safe and effective when used according to package directions. More information about ZzzQuil is available at www.zzzquil.com. Like ZzzQuil on Facebook so you can get to know more about them and stay up to date on what ZzzQuil has going on. Probably a good thing to have on hand, but I prefer not to take anything at all. I have discovered that if I avoid caffeine in any form, avoid exercise an hour before bedtime, and if I avoid looking at the computer or Kindle screen for a couple hours before going to bed, I'm more likely to be able to sleep. I am getting this for my husband. He thinks NyQuil is the way to go, even without a cold - because he hates pills. It's tough to him to unwind after work sine he doesn't get home until 1:00 am, and he is normally up with our daughter by 8:00. (Hey, I know *I* couldn't just go to bed for the night when I get home at 5:00 without taking something either!) Anyway - a solution that's just sleep-only sounds like a much better alternative. I am going to have him try it, thanks for sharing, Kathe!! i used to chug zzzquil when boris was deployed. it was amazing. i just wish the flavor was better. I will have to try this then! Matt recently bought me a bottle of this because of my sleep issues lately, and I haven't tried it yet as I too was skeptical. Good to know it works!